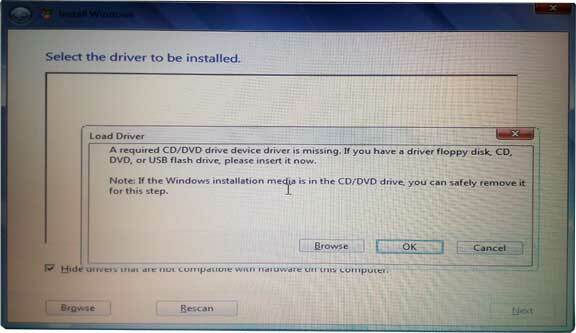 Note: If the Windows installation media is the CD/DVD drive you can safely remove it for this step. Sometimes above message appears in the mid of Window OS installation process due to mismatch in available drivers of installer file. Generally it appears when installing Windows OS through USB flash drive, Memory stick or external USB HDD. Instead going into technical depth, let us talk about its simple solutions. 2. There is also a chance of installation file corrupt on USB drive. Make USB flash drive bootable once again with some other third party software and try the installation. 3. Last and ultimate solution is – installing window OS through CD drive. For that DVD drive and a Installation DVD is required. This option works most of the time. Note: If all above options fail, then there may be some issue in its Motherboard. Refer manufacturer website for more.